Sky Lanterns are an amazing addition to any celebration. Sky Lanterns are basically small, translucent hot-air balloons. They have a small fuel source in the middle that, once lit, will lift the lantern slowly into the sky with a soft glow. These lanterns are made with fire-retardant, 100% biodegradable material. To achieve the best effect, at least 10-20 should be used at one time (the more, the better). Sky Lanterns are a fantastic wedding sparkler alternative, if your wedding venue does not allow sparklers! 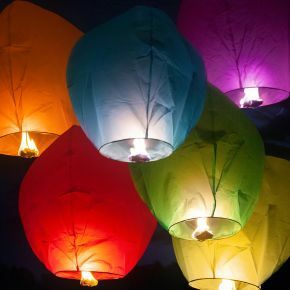 This 12-pack of sky lanterns features 2 each of 6 vibrant colors, making them perfect for any celebration! They are made with 100% biodegradable, flame-retardant materials and come fully assembled (no need to attach a fuel cell). Whether you are celebrating a birthday, New Year's, or pairing these with some white and blue Sky Lanterns for the 4th of July, our Red Sky Lanterns make for an awesome, fiery display! Our Red Sky Lanterns are made with 100% biodegradable, flame-retardant materials. They are shipped fully assembled (no need to attach a fuel cell). American Flag Sky Lanterns are perfect for your next patriotic celebration! 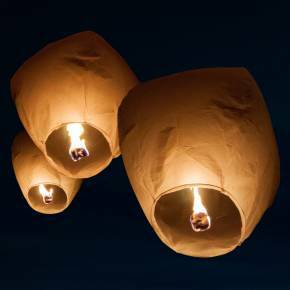 These Sky Lanterns have a small fuel source in the middle that, once lit, will lift the lantern slowly into the sky with a soft glow. These American Flag lanterns are made with fire-retardant, 100% biodegradable material. Just in time for Halloween! Our new, jack-o-lantern Sky Lanterns are great for Halloween, Diwali, and other Fall celebrations! Like the rest of our Sky Lantern products, these have a small fuel source in the middle that, once lit, will lift the lantern slowly into the sky with an orange glow. These Halloween lanterns are made with fire-retardant, 100% biodegradable material.